Mekedatu means Goat's Leap in Kannada. Here the Cauvery river jumps in to deep narrow gorge over which even a goat can leap. One can drive only up to Cauvery Akravati Sangama. 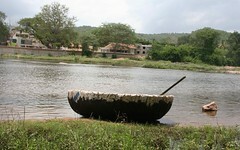 After this you can cross the river in coracle ( circular boats ) or by walking if the water level is low. From here Mekedatu is 4km downstream. There is only one bus available at the other end which can take you till Mekedatu. The rocks at Mekedatu get slippery during monsoon. Chunchi Falls is also very nearby for which you have to turn before reaching Sangama. Post monsoon is the best time to see the falls. August to January is the best season. Only some shops selling cool drinks and snacks are available at the place. Coming with packed food is essential. Mekedatu is 90km from Bangalore. Route 1: Bangalore - Kanakapura - Sathanur - Chunchi Falls - Sangama - Mekedatu. KSRTC buses and private buses are available to Kanakapura from KR Market. From Kanakapura there are only few buses to Sangama.